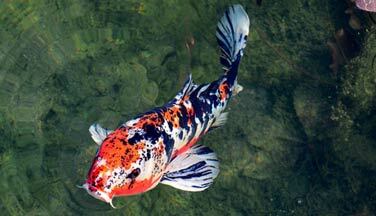 Koi carp is THE star of our ponds. Still, she started her career as a food! 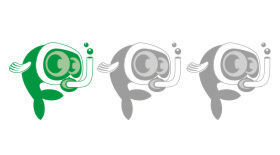 As it progressed, it became the beautiful ornamental fish we know today. 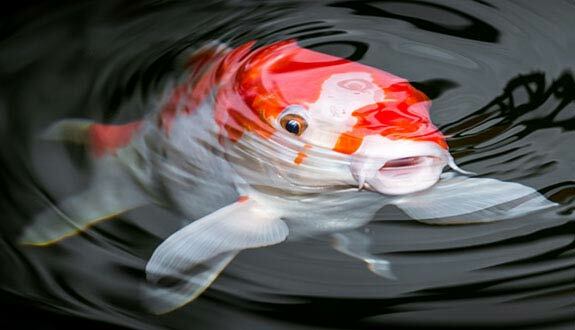 Peaceful and kind, koi carps are particularly endearing. This sheet will help you to offer them the lifestyle they deserve! How to feed the Koi? 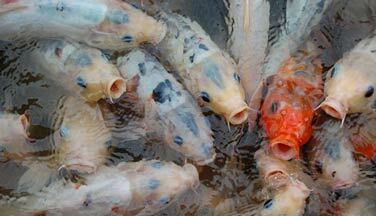 Specialty food of High quality is the staple diet of Koi carp. There are different pellets depending on the season because the carp's metabolism accelerates or decelerates depending on the temperature of the water. Its energy also needs to vary. 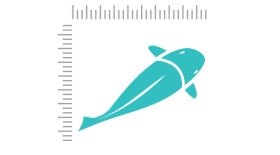 Adapt the size of your food according to its size and age. If you have fish of different sizes, mix pellets of different sizes so that everyone eats according to the size of their mouth. Complete this diet with occasional meat (whole shrimp for adult carp, daphnia, gammarus, Asellus aquaticus, bloodworms and even earthworms!) and in vegetables (lettuce, kiwi, orange, watercress, Lemnoideae, garlic which is also a very good supplement because it is antiparasitic, antibiotic and revitalizing). A little Montmorillonite clay from time to time will bring a calcium benefit. You can also give whole grain bread occasionally to your carp. 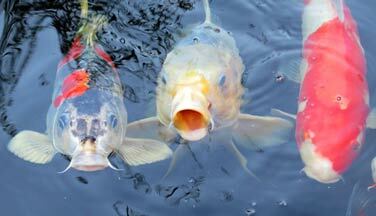 Koi Carps are omnivorous and have a good appetite. They will be more fit with 2 or 3 meals a day than with a single fat one. So you can give it its daily ration in several times. If you find that an individual does not come to eat for several days in a row, it is that it isn't well (stress, illness...). 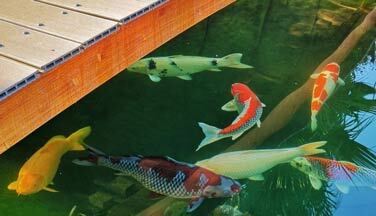 If you want to tame your carp, distribute the food always at the same place in your pool and at regular times. Put a little candy in your hand and leave it in the water without moving. Repeat the operation daily. Thus, they will get used to you and with a little time they will even eat directly in your hand! What kind of behavior does the Koi have? Who can live with the Koi? Gregarious, they like to live in a group (although elderly people prefer to live alone). Do not combine them with smaller fish that could be swallowed accidentally. 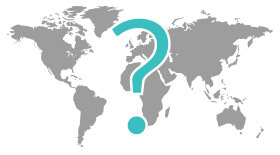 To limit the proliferation of small animals in the water of your pool, combine fish such as Sterlet, Leuciscus idus, Tench and especially the Gobio gobio. 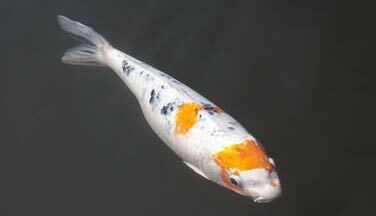 It will also live very well with large goldfish but there is a risk of hybridization. And why not frogs? In this case, you will not have to install a net to your pool (see "its pond"). Be careful, frogs are pretty noisy! How to breed the Koi? 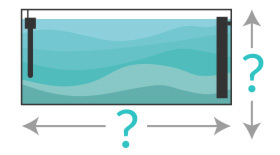 Spontaneous when the water is at 18/20°C or 64/68°F (usually May / June). There is a predation of the parents. To ensure the survival of a maximum of fry, we can provide a specific spawning pond 0.5 / 1 meter or 20 to 40 inches deep. Powerful filtration will ensure good oxygenation of the water. 3 males for 1 female over 3 years old. The female lays eggs that males subsequently fertilize. A laying may include 200 000 eggs. Remove the parents after spawning. The incubation lasts from 72h to one week. Fry are gray, and will grow in colour. 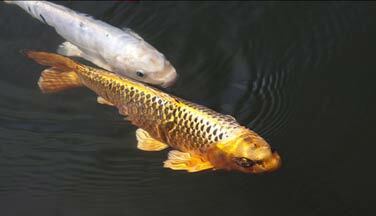 Carps grow quickly up to 3/4 years, then slow growth but do not stop, they grow up all their life. 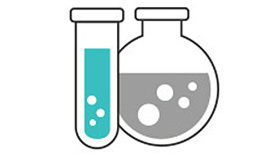 Food fry: daphnia and specialized dry food. Which pond for the Koi? 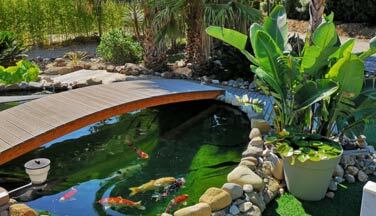 Choose ponds with regular shapes (oval, round, square or rectangular) without excessive shrinkage. 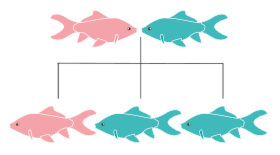 It also takes enough depth because the koi carp swim on all axes (length, width, depth). Koi carps are big eaters, and therefore big polluters! You need to install a powerful filtration. However, be careful not to make the water too agitated because you could not contemplate your fish (position your rejection well). The filtration will clean the water by destroying organic waste and keep it healthy. Choose your filtration carefully according to your configuration because it will prevent your beautiful pond from becoming a swamp! 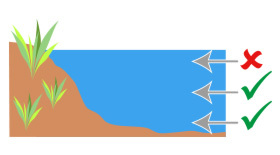 A cascade system can be useful for oxygenating the water. On the plantation side, choose plants that are emerged, half-immersed or floating. In fact, immersed plants will not resist the nibbling and uprooting of fish. For example, you can choose water lilies, water hyacinths, reeds ... The addition of plant is beneficial because they contribute to the biological filtration of water, provide hiding and shade to fish and beautify your pelvis! Regarding the location of your pond, it is better to install it partly in the shade (at least 35% of its surface) to avoid heat stroke and the proliferation of green algae. Also plan to install a net to protect your pond from cats and herons. A great height of water will protect your carp from cats because they will be able to hide. For the herons, they seem to be frightened by glare of bright light. Thus, you can try to arrange around your basin a saucepan or a well placed silver bowl. 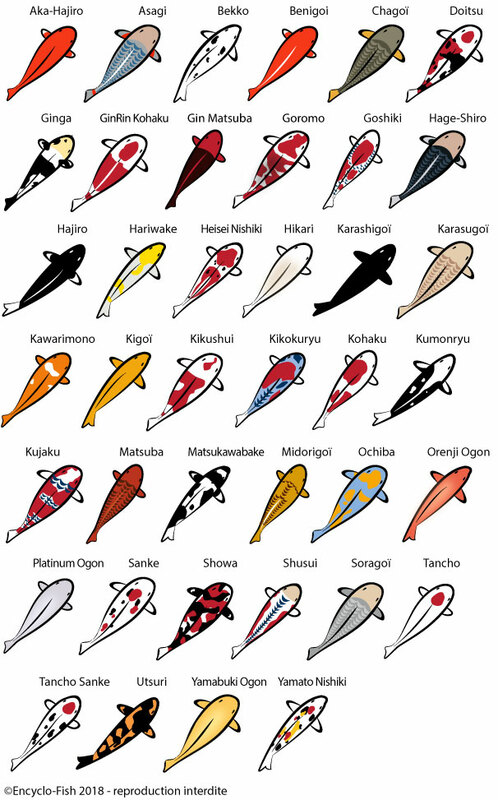 What are the colours and patterns of Koi? What are the colours and patterns of Koi?? 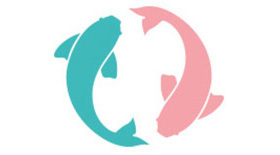 Koi carp is a variety derived from the wild species of Cyprinus Carpio (Carp). It is therefore a cousin of the goldfish. Moreover, it can hybridize with it (the hybrid offspring is sterile). This species has been breed for more than 2000 years in China and Japan, but its true breeding did not begin until the end of the 18th century. Originally, it was called Nishikigoïs and was raised to serve food (unlike the red fish that was an ornamental fish). 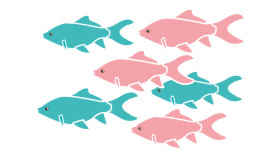 It is almost impossible to meet two identical Koi Carps. Indeed, its colours and patterns vary throughout its life, sometimes changing completely. 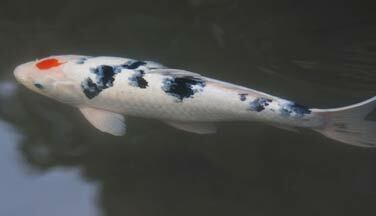 That's why when you buy koi carp, pay attention to its health rather than its appearance that will change over time. Choose a lively and active fish, with a straight spine and a large mouth. In winter (below 8°C or 46°F), it stops feeding and its activity is reduced. 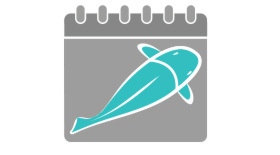 This decline in activity is normal and is even beneficial for the metabolism of fish. Therefore, do not heat your pond if its water temperature stays above 3/5°C or 37/41°F.